The koala (Phascolarctos cinereus or inaccurately, koala bear[lower-alpha 1]) is an arboreal herbivorous marsupial native tae Australie. It is the anly extant representative o the faimily Phascolarctidae, an its closest livin relatives are the wombats. The koala is foond in coastal auries o the mainland's eastren an soothren regions, inhabitin Queensland, New Sooth Wales, Victoria an Sooth Australie. It is easily recognisable bi its stout, tailless body; roond, fluffy lugs; an lairge, spoon-shaped neb. The koala haes a body lenth o 60–85 cm (24–33 in) an weighs 4–15 kg (9–33 lb). Pelage colour ranges frae siller grey tae chocolate broun. Koalas frae the northren populations are teepically smawer an lichter in colour than thair coonterpairts further sooth. 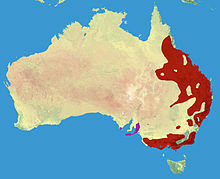 It is possible that these populations are separate subspecies, but this is disputit. ↑ Koala bear is a common term ootside o Australie, tho koalas are marsupials, nae beirs. ↑ 3.0 3.1 Groves, C. P. (2005). "Order Diprotodontia". In Wilson, D. E.; Reeder, D. M. Mammal Species of the World (3rd ed.). Johns Hopkins University Press. p. 43. ISBN 978-0-8018-8221-0. OCLC 62265494.